I own lots of ribbon for scrapbooking. 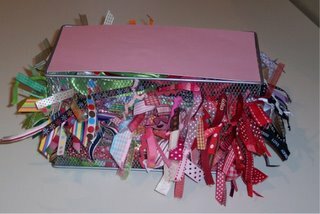 I spent hours a while back, winding it around cards and securing each ribbon with a pin. It looked neat and organized but every time I went to get some ribbon out - I stuck myself! Seriously! It was getting old and I want to have my ribbon easily available. I dreaded using it! I decided that I needed a way of organizing it that would make it easy to pull each ribbon out and snip off just what I needed. I went on the lookout for a container with holes. I ran across this CD holder in the office aisle at Target. It was $5.99. It barely fit all my ribbon but I made it work!! I went thru each color, pulling each ribbon thru a hole. It was very easy. The holes are the perfect size. If I had it to do over, I would go around and around until I had all the bottom holes filled. I did one color at a time which made it hard to get to the bottom holes on some sides. I just scrunched it down on the inside and it stays there! Now I can pull out 1" or 6" and snip it off and I can see it all in a glance. I have a piece of paper on top to act as a cover. I want to decoupage a piece of chipboard that will be prettier. Here's what it looked like before I filled it. I know some of you are going "ha, ha, that would never work for all my ribbon!" but hey, it works for me! This is quite a bit of ribbon. I'm sure you could get a similar container only deeper/wider, whatever. This one is pretty small so it fits well on my desk. I have all my colors together and then a section for multi-colored ribbons like American Crafts. I'll be on the lookout for your new ribbon creations. way cute...but i have a question...what keeps it from getting tangled when you pull one out? www.containerstore.com has some bigger baskets like these for similar pricing -- if folks needed something bigger than a CD holder. What a great concept -- especially since you put like colors together...you are the clever one. Thanks for sharing...you are spurring me on. And fortunately, due to today's weather forecast I am VERY cool! I really like this and it looks great too. Very portable for crops. Great idea Tracie. Just love how the basket looks filled with all those colorful ribbons. This is the third time I have read this particular post. Would you just get over being sick and get on with brightening my homebound life!!!!!!! !